As it applies to wallcoverings, I've always been a fan of small, organic patterns with well defined textural qualities.Then again, I've never been one to turn down a fabulous mural as well. Needless to say, making a wallcovering decision in in our offices often times resorts to flipping a coin. The newest introductions to Hartmann & Forbes' Natural Wallcoverings Collection for 2014 make the decision that much easier. Inspired by America's shorelines, the six new designs feature color palettes taken from moments in nature - scenic mountain lakesides, soft sand beaches, sparkling urban river walks. 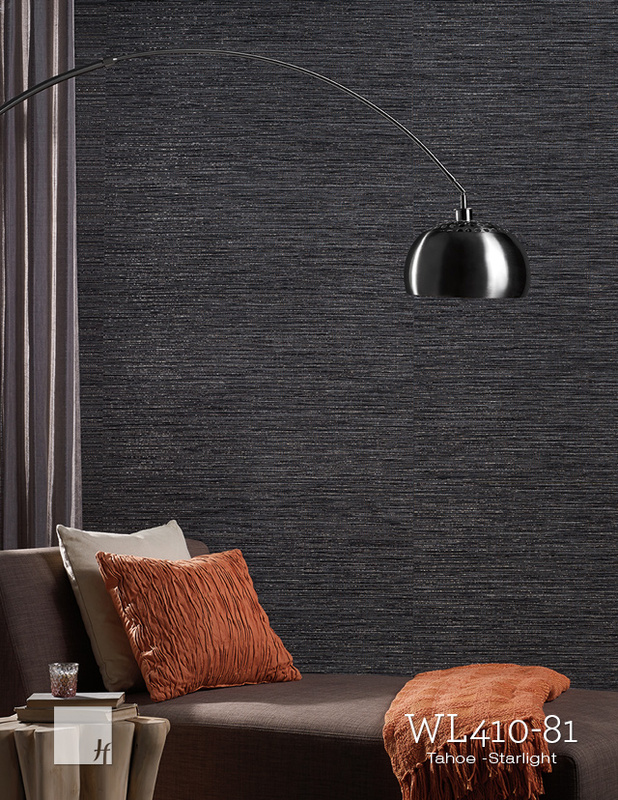 The additions bring Hartmann & Forbe's Natural Wallcoverings Collection to 17 weaves. To the trade. Lighting of most any kind is certainly a kind of Kryptonite. Maybe it's because lighting fixtures can either make or break any design, no matter how great the rest of the components of the scheme may be. Or maybe because one great fixture can make the biggest difference when selecting decor for one's own space. Space Array, an avant garde pendant designed by Baltimore interiors and products designer Mick Ricereto for ILEX Architectural Lighting is certainly one of those defining fixtures. Composed of aluminum "leaves" which are easily removed or adjusted, Space Array is designed to be an adaptable fixture allowing the occupant to customize the fixture's overall design rather than replacing it when the mood strikes for a new design solution. Space Array is available in several sizes, can be specified as either incandescent or LED and can be finished in Matte White, Teal, Black and a number of custom colors. .
Kallista, the family of luxury products developed by parent residential plumbing giant Kohler, has since its inception come to be known for it's classic, tailored products, infusing the design details of the 1920's, 30's and 40's with contemporary function. With collections meant primarily for the residential bathroom, Kallista continues their expansion into the kitchen workplace with the introduction of their Jeton Pull-Down Kitchen Faucet, a recent collaboration with renowned architect and designer Bill Sofield. Sofield's design is a marriage of, in the words of the designer, "hard with soft, straightforward with complex" forming the faucet and handle in order to achieve maximum reflection so as to avoid ornamentation. Available in chrome, nickel silver, brushed nickel, and black nickel, the faucet maintains an eco-friendly 1.8 gallon per minute flow from its three function spray-head. Available through distributors. As they say, Diamonds are a Girl's Best Friend. Or in the case of the editing staff at DCoopMedia, teeny tiny sparkling rocks laid in classically stimulated patterns are Our Best Friends. With that being said, if mosaics are our jewels than Virginia based stone artist New Ravenna is our jewelery store. A fanciful blend of cultural references, from Paris to St. Petersburg, Sara Baldwin's newest collection for New Ravenna culminates in designs which are steeped in gilded history, beckoning to a historic place and time. The Aurora Collection's 24 hand crafted designs feature 24k gold glass, jewel glass, natural shell and New Ravenna's signature cut stones offering a stunningly brilliant appearance fitting for any Newport Mansion or European Chateau. Through the Trade. When budgeting for a kitchen remodel it can often be hard to find well-designed, aesthetically pleasing cabinetry line with a not-so-budget breaking price tag. Great design and luxury features aren't normally the hallmarks of lower priced collections. Rutt HandCrafted Cabinetry, through their sibling brand Rutt Regency, does just that in their newest kitchen collection. Morgan, the brand's latest cabinetry collection, examines the proportion and straightforward qualities of American icon Gustav Stickley and his peers, developing an aesthetic combining soft transitions, heafty end panels, and horizontally oriented features, not to mention Rutt HandCrafted Cabinetry's meticulous attention to detail. Be sure to catch Rutt's Prairie Collection, featured in last week's Luxury Product's Spotlight.